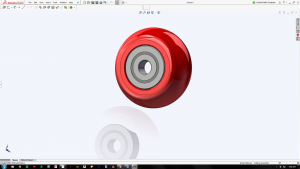 Urethane Wheels – Custom Cast Urethane Wheels! Urethane Wheels ? You’ve come to the right source! Robot Wheels: Robot wheels are custom designed by robotics engineers with tight tolerances that will operate well in extreme environments. Cast from high-quality resin for extreme vibration damping so that video images provided by the robot are clean. Robot wheels will hold up well against water, heat, chemicals, solvents and are custom made with superior physical properties vs similar material such as plastic or rubber wheels. Gauge Wheels: Gauge wheels are commonly found in agriculture equipment that is typically supplied on a heavy duty rim and is coated with a tear-resistant urethane material suitable for outdoor conditions. The gauge wheels used in the agriculture industry will ride on the earth’s surface to provide depth control. Heavy Duty Wheels: Heavy duty wheels are perfect replacements for your custom urethane wheel or roller needs. All replacement heavy duty urethane wheels will provide maximum performance in your application and will meet or exceed OEM specifications. Flanged Wheels: Flanged wheels take the shock and vibration out of the load being placed on the wheel. Traditional steel flanged wheels will transfer the shock and vibration to the equipment and operator that may shorten the service life of the wheel and is also hard on the equipment. Urethane Roller Coaster Wheels: After each of the roller coaster wheels are machined within tolerance each one will also be inspected to ensure fitment. Any hardness roller coaster wheels can be achieved at Plan Tech with a variety of different additives for special applications, our most popular additives is an antistatic urethane additive which will discharge all electricity that would build up around the wheel during operation. Urethane Band Saw Idler Wheels: Plan Tech can recondition used worn out idler wheels as well as fabricate new urethane band saw idler wheels in high volume for manufacturing facilities. When we receive a sample wheel or an existing part we will reverse engineer OEM parts to match the new coating too. Unlike small bandsaws that do not have idler wheels, Plan Tech produces idler or drive wheels for large bandsaws. Crane Wheels: Urethane crane wheels are custom cast from our toughest material available for the most demanding heavyweight applications. Large crane wheels will consist of a reinforced steel core or rim. Plan Tech can custom cast almost any size urethane crane wheel rated for the most demanding applications. Our urethane will hold up to extreme conditions including underwater applications and is chemical resistant to most chemicals and oils. Bandsaw Polyurethane Drive Wheels: We can also custom fabricate the steel pulleys or drive wheels to reproduce damaged or worn out existing pulleys, as well as design new bandsaw polyurethane drive wheels for large manufacturers around the world. Plan Tech also stocks a full line of additives to enhance the physical properties of our urethane for special applications such as FDA food processing bandsaw polyurethane drive wheels and metal detectable urethane for existing X-Ray equipment. Urethane Guide Wheels: Urethane guide wheels are most popular in a 95A hardness with many different additives available for any applications. Our most common additive is called armorglide which will add lubricity and increased abrasion resistance to the urethane guide wheels. 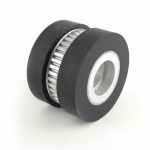 Plan Tech has also seen an increase in robotic urethane guide wheels with an anti-static additive to allow our polyurethane guide wheels to be conductive. Conductive Wheels: Conductive poly wheels are custom cast with special additives to produce conductive urethane wheels. These wheels and rollers are the most popular in the robotic industry to protect sensitive electrical components. 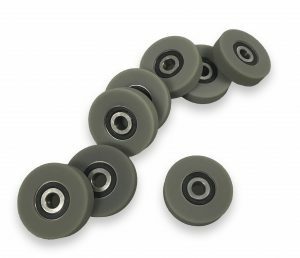 Polyurethane Wheels: Polyurethane wheels with bearings are made from a TDI based high-quality ether-based urethane and typically supplied in a 95A durometer. Consisting of a bearing that is media blasted before it is chemically bonded our polyurethane wheels will last for years and are most commonly found in shipping centers. Urethane Bandsaw Drive Wheels: Urethane recoating bandsaw drive wheels are one of the custom specialty services we provide our industrial clients. Urethane is used in the woodworking industry, large band saws sometimes the size of a small building are used to process wood. Industrial Polyurethane Wheels: Industrial Polyurethane Wheels are tops in abrasion and wear resistance. With a full line of post-secondary operations, we can finish and assemble your industrial polyurethane wheels to meet your most stringent specifications. In fact, they often times wear better than OEM replacements at a fraction of the cost. V-Groove Wheels: V-Groove Wheels can be manufactured from various materials for your application and may be machined to almost any shape to match rolling surfaces. For example on tracks, angle-iron, and any other riding surface. We can duplicate your existing v-groove urethane wheels or we can reinvent the wheel for your custom v-groove wheel specifications. Urethane Drive Wheels: Drive wheels are very popular due to the ability to tailor urethane to any hardness required for the application. Urethane drive wheels will have a key slot or bolt to a hub that will drive the wheel. 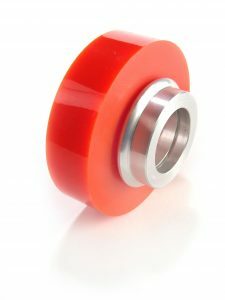 Urethane Caster Wheels: Urethane caster wheels are made of the highest quality urethane that will carry higher capacities than rubber. Standard urethane caster wheels have a hardness of 95A durometer. The urethane is chemically bonded to an aluminum or steel core with bearings to rotate smoothly. AGV Wheels: AGV wheels also know as AGV stacker wheels are custom cast from high-quality material for any harsh environment or continuous operation. AGV wheels can be up to 12” in diameters and are available in any hardness or color. Urethane Idler Wheels: One of the reasons our urethane idler wheels wear like steel is because of Plan Tech’s top quality urethane suppliers. Urethane Idler wheels are liquid cast and chemically bonded onto heavy-duty iron wheel centers. Polyurethane Stock Feeder Wheels: Polyurethane stock feeder wheels are just like regular polyurethane wheels except they have one purpose which is to feed product into the application. Most polyurethane stock feeder wheels will spin the product for labeling but are not limited to high abrasion applications like tightening the cap on bottles. Skateboard Wheels: While most skateboard wheels are 80A Plan Tech is able to tailor our urethane material for special applications, and is able to custom mold urethane skateboard wheels at a rapid pace with 30+ years molding urethane products experience. Plan Tech uses only high-performance material and curatives from world chemical leaders with rapid tool design and mold making in-house. 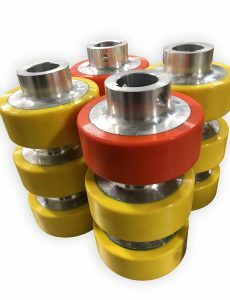 Urethane Roller Skate Wheels: Urethane roller skate wheels are hand cast at Plan Tech in high volume with advanced compression molding technology. Casting urethane roller skate wheels using this technology allows us to create any hardness or color roller skate wheel and custom logos can easily be molded into the skate wheels as well. Urethane Flume Wheels: Flume wheels are featured on many roller coasters around the world that are supplied from Plan Tech. We utilize high-performance polyurethane material from world leading chemical companies. Most urethane flume wheels consist of an aluminum core that is machined in our state of the art machine shop. Scooter Wheels: While “softer” urethane gives better grip to the wheel of the scooter, more speed is provided with “harder” urethane scooter wheels. Also, the resistance to roll is lowered with more “rebound” which causes the wheel to bear more energy and roll faster. During rotation, the urethane scooter wheels compress and rise. Polyurethane Load Wheels: It is true that color is not an indicator of hardness or quality, our polyurethane load wheels are nevertheless available in diverse colors and our products range from simple to intricate designs. Plan Tech’s polyurethane load wheels are the product of our hardworking team of professional technicians who are renowned for being the best in the industry. Urethane Longboard Wheels: Urethane longboard wheels have been a well-known name since the 1960s. Any size or profile of the urethane longboard wheels can be cast from materials with high-performance ability through compression molding techniques. Automated Guided Vehicle Wheels: Automated guided vehicle wheels can be up to 12” in diameters and are available in any hardness or color. Most common Automated guided vehicle poly wheels are cast from an 80A hardness for maximum service life and good traction properties in any environment including freezers and warehouse floors. Zero Crush Wheels: Zero crush wheels are wheels that are tailor-made to have tight tolerances to be able to operate in environments with an extreme condition. Like most of our products, they are made from first-grade quality polyurethane resin which gives them the ability to dampen vibrational effect efficiently. Extended Hub Wheels: Extended hub wheels are in high demand in the various industries across the United States. In our over three decades of manufacturing urethane parts or products, we have become one of the best producers of extended hub urethane wheels in the United States and our ability to manufacture high-volume extended hub poly wheels that are of world-class quality with a short turnaround is second to none in the industry. Urethane Rotator Wheels: Our custom formulated urethane rotator wheels offer effective wear resistance, long service life, and high-performance ability. We produce them in different sizes and hardness and are also non-marking. 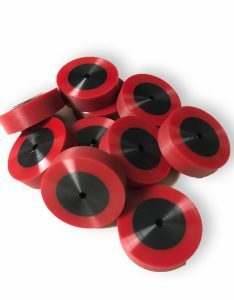 Urethane Spinner Wheels: We are highly skilled in customizing the physical properties of our urethane materials for the production of world-class quality urethane spinner wheels such as product containers, jars and other consumer products that need lids screwed on. 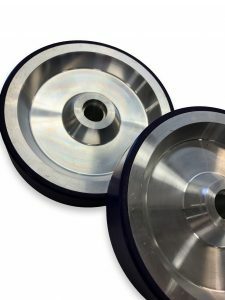 Some of the advantages offered by our urethane spinner wheels include; noise absorption, corrosion and rust resistance, remarkable chemical resistance and long service life that is second to none. Urethane Feed Wheels: Urethane feed wheels are in every way similar to regular polyurethane wheels except that they have one function and that is to feed product into the application. These special wheels are often coated in a soft urethane so as to give them traction when the product enters the wheel and we are well known in the industry for our specialty in urethane grinding as well as turning, and we have recently added to our operation another new custom built lathe. Hold Down Wheels: We have a team of highly talented technicians who are skilled in the art of producing hold down wheels that meet the requirements of a wide range of application. The urethane wheels we have on offer are made from world-class quality materials from globally renowned chemical dealers. With our hold down poly wheels, you can be confident of superior wear capability, high abrasion and chemical resistance as well as outstanding ability to withstand harsh environments. Pallet Jack Wheels: We have been manufacturing polyurethane wheels and parts for over 30 years now, and we have therefore become highly specialized in producing pallet jack wheels that meet the highest global standard. Our pallet jack poly wheels are renowned in the industry for their impressive ability to resist wear and corrosion, high abrasion and chemical resistance as well as long service life. Poly Coated Wheels: Poly coated wheels are one of our numerous signature polyurethane parts that we manufacture. Like all of other urethane parts or products, our utilization of high-quality materials from globally renowned producers in manufacturing our urethane coated wheels is one of the reasons they are rated among best wheels in the world. Roller Wheels: Our most standard practice for casting high volume roller wheels with a tight tolerance is by over-molding the urethane roller and after the urethane material is fully cured then machining each wheel for a tolerance as tight as +/-.005”. Polyurethane Escalator Wheels: Our polyurethane escalator wheels provide outstanding resistance against wear, corrosion, abrasion, and chemicals. And they are also renowned for their remarkable ability to withstand unfavorable environments. 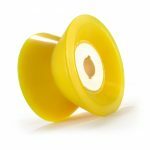 Elevator Wheels: No matter the profile of polyurethane elevator wheels you need, you can count on us to manufacture urethane elevator wheels that will meet the requirement of your application. No other brand in the industry boasts a team of engineers with better technical expertise to handle your polyurethane elevator wheels project from design to world-class production. Non-Marking Wheels: We are renowned for being one of the largest producers of non-marking polyurethane wheels in the industry, and that is due to our ability to manufacture the product in high volume at a swift turnaround. Our non-marking polyurethane wheels offer high-performance ability and long service life. They are capable of resisting wear, abrasion, and chemicals as well as withstand the harsh environment. FDA Compliant Wheels: At Plan Tech we understand that it is imperative that our products, materials, and equipment are FDA Dry Approved. As such our customers are specifying FDA compliant wheels that are of premium grade materials, close tolerances, and custom formulations. Solid Wheels: As a market leader in developing 21st-century polyurethane materials, Plan Tech makes use of the very best in-house technology and facilities to produce its solid polyurethane wheels. Made from high tech polymers and formulation, the Plan Tech engineering team can manufacture your solid polyurethane wheels in any shape, size, hardness and to any color you choose or that suits your application, whether in small or large batches. Hyperloop Wheels: For added strength Plan Tech will work with different Hyperloop design teams to add a positive lock groove for an superior bond strength. These wheels will be traveling at a very high rate of speed upwards of 600 MPH and will need to be high speed balanced before being used. Plan Tech can do all the turning to the urethane to include any customized profiles desired for Hyperloop Wheels. Wheelchair Wheels: Our urethane wheelchair wheels eliminate installation headaches and save you time and money. They allow for a slight compression when going over uneven surfaces, making them the best urethane wheelchair wheels for comfort, rolling resistance and a better experience for wheelchair user’s independence. 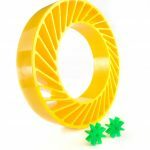 Clothes Dryer Wheels: Our team of engineers produces clothes dryer urethane wheels that are truly unique, designed to withstand elevated temperatures over an extended life cycle. Plan Tech’s clothes dryer wheels are the preferred solution in the industry, it features reduced energy consumption and can be used where chemical resistance and noise are critical performance characteristics. Car Wash Wheels: Plan Tech’s car wash wheels offer excellent performance in extreme atmospheres due to our unique urethane materials used during production. This gives them outstanding resistance to oxidation, oil, and most solvents or chemicals, they are hard, tough-yet resilient and can withstand abuse. Track Wheels: Plan Tech has been in the forefront of the urethane industry since its establishment 30 years ago. We have decades of hands-on experience in urethane track wheels and other polyurethane technology. Small Wheels: Our small polyurethane wheels can also provide resistance to corrosion, cutting, floor protection, and noise reduction all while providing an industrial grade material that can handle a lot of capacity. Known to be non-conductive, and superior to other materials in withstanding oil, grease, cutting, and chunking our small wheels guarantees an exceptional performance. UpStop Wheels: Plan Tech’s upstop wheels have been considered the perfect upstop wheel for high-speed roller coaster experience; this is because it offers low rolling resistance, smooth ride performance, high load endurance and high durability or low maintenance cost. Wheels For Exercise Equipment: These wheels are manufactured by Plan Tech using urethane as the main material due to the strong characteristics of urethane. Urethanes are known to exhibit high abrasion resistant, excellent tolerance, and can withstand harsh environments. High Traction Robot Wheels: High traction robot wheels are applied in both short and long production, its flexibility, color, hardness, and durability makes it the top choice of robotics engineers. These benefits amongst others are what we put into consideration at Plan Tech throughout the production process. We ensure that the high traction robot wheels manufactured are highly resistant to acids, harsh chemicals, solvents, and abrasion. Skew Wheels: At Plan Tech, our engineers and technical team use high-quality urethane formula to manufacture our urethane skew wheels. Our major priority is to ensure that our wheels and custom molded components and parts are standard and of high quality. Our engineering team has decades of urethane industry experience and can help determine the best custom wheels to fit your application requirements. We offer UV stabilized colors and a variety of durometer choices for all of our urethane wheels. 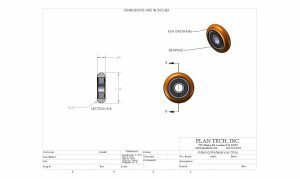 Plan Tech can supply custom wheels complete with inserts or hub assemblies as needed. Plan Tech’s wheels exhibit excellent tolerances for consistent wear, often at considerable RPM’s and weights. Based on wheel samples or specifications, we can work with you to determine the best urethane wheels types and sizes. We perform tests according to an established set of standards provided by an accredited testing organization such as the Society for Testing and Materials (ASTM) who define the procedures in detail. Plan Tech’s custom wheels are an excellent way to provide a layer of durable, long-lasting shock-absorbing cushion between your product and the rolling surface. Our wheels are available in almost any color or durometer desired for your application. They provide high impact shock absorption, noise reduction and are considered the best urethane covered wheels in the industry! Some of our large Fortune 500 clients all the way down to a new inventor ask us at Plan Tech what is a polyurethane wheel? For over 30 years we have focused on using speed and precision to manufacture the highest quality industrial wear resistant cast wheels for our customers. Urethane can typically last a lot longer than rubber even in most abrasive applications plus we have a full line of urethane additives to enhance your wheels performance! A particular strength is the breadth of our in-house capabilities such as custom cast wheels which, when combined with our extensive experience, enables us to deliver tight tolerance custom wheels while maintaining the quality control and cost effectiveness our customers require! Please Contact us for further details regarding your specialty wheels!